We are surrounded by colour every day…and often everything around us seems complicated. So for a moment lets look at something in plain black and white. This weeks photo challenge with Kim Klassen is to create a photo in black and white and use one of her many creative textures. I’ve used the texture ‘organic’ and just love the extra softness of the edges. I also love the dappled texture of the eggs. 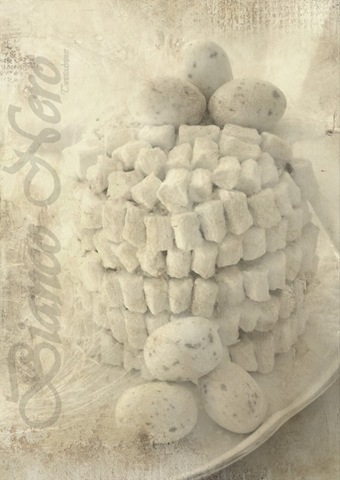 The title for this photo is Marshmallow Velvet…I’ve been creative (finally again) in the kitchen making red velvet cakes and covering them in icing and marshmallows…I love the phrase black and white in Italian…switch them around Bianco Nero. I love the quote at the end of your post. This red velvet cakes looks delicious even in B&W!